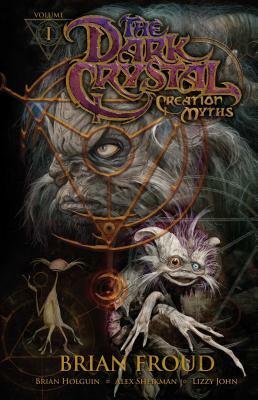 Jim Henson's The Dark Crystal Creations Myths available for the first time in paperback! James Maury "Jim" Henson (September 24, 1936 – May 16, 1990) was an American puppeteer, artist, cartoonist, Imagineer, inventor, screenwriter, film director and producer, best known as the creator of The Muppets. As a puppeteer, Henson performed in various television programs, such as Sesame Street and The Muppet Show, films such as The Muppet Movie and The Great Muppet Caper, and created advanced puppets for projects like Fraggle Rock, The Dark Crystal, and Labyrinth. He was also an Academy Award-nominated film director (for his short film Time Piece), Emmy Award-winning television producer, and the founder of The Jim Henson Company, the Jim Henson Foundation, and Jim Henson's Creature Shop. Brian Froud is known worldwide as the preeminent faery artist of our time. He has published over twenty-five books, including the best selling Faeries, Lady Cottington’s Pressed Faery Book, and many more. Brian and his wife Wendy have just Trolls, a major hardcover book published by Abrams Books. Brian worked with Jim Henson for many years and was the designer for the iconic films The Dark Crystal and Labyrinth. Brian’s art is represented in collections throughout the world and can be seen at Amazing Fine Art in New York. Born in the USSR, Alex Sheikman immigrated to the US at the age of 12 and shortly thereafter discovered comic books. Since then, he has contributed illustrations to a variety of role playing games published by White Wolf, Holistic Design, and Steve Jackson Games. He is also the writer and artist of Robotika, Robotika: For a Few Rubles More, Moonstruck and a number of short stories. He lives in Northern California.